WOW! 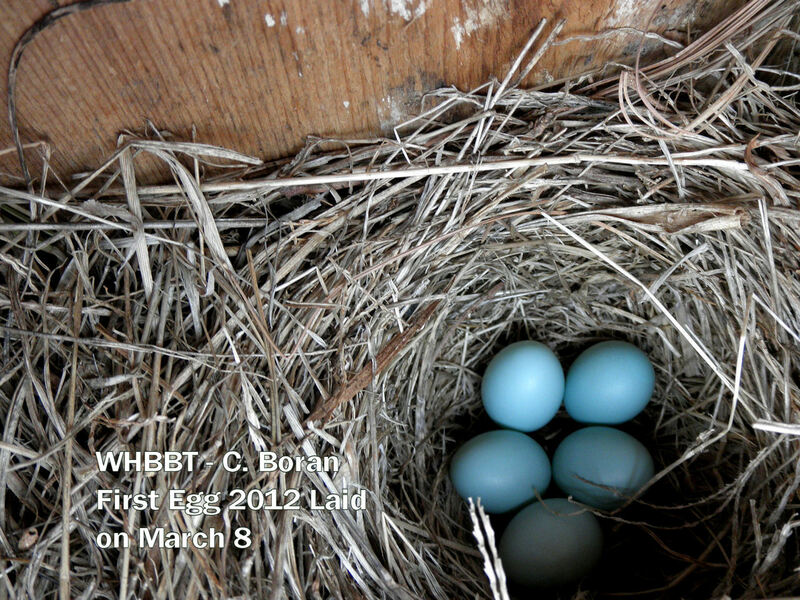 EARLY BLUEBIRD EGG on MARCH 8, 2012! How do I say with jubilation: WELCOME BACK, SPRING? How about a very early egg laid by a bluebird? What a way to start the season for the WHBBT! The nestbox that had the earliest laid egg last year on my own bluebird trail has again been the first nestbox for this nesting season–EARLY EGG LAID–On March 8, 2012, I found my first laid bluebird egg! THIS IS VERY EARLY, even for Southwest Virginia and North Carolina. Could this be the earliest in the state since VBS has kept records? We are presently finding out. The Virginia Bluebird Society is canvassing the County Coordinators for ALL cavity-nesting species earliest egg laid for this year. T he warmer weather tells the birds to get movin’ and groovin’, and this couple sure did. I expect hatching on or around March 26th. My first bluebird egg laid last year was March 27th. What a difference. Are we on a global warming trend, or is it the same couple just likes to get a jump start on claiming this box at this particular location? This is all part of why we keep records. More to come soon on those findings! So, with Spring now here (officially it’s March 21st), we can welcome everyone back to this site for updates. I have some changes to make on my nestboxes section—a couple of moves and additions. More boxes have been built in the local workshop (many thanks, Carl)—the complete nestbox setups include the boxes, the hardware, the conduit, and two predator guards. I have a new program on all this–all funds and costs for these goes back to the needy in our community. More to come on what that program is about. Also, many thanks to Wills Ridge Supply, Inc., in Floyd, VA, for helping me with the wood and supplies for the Woolwine House Bluebird Trail! The staff there is fantastic! It makes shopping for everything I need pleasant! I should mention I have two new photos of the first clutch 2012 nesting season. See them below–I took one with flash and one without flash. Note the differences in egg colors. The photo with flash makes the eggs have more of a turquoise color. The photo without flash makes the eggs look bluer. You’ll also notice a difference in the grass color. The photo without the flash has the proper color of the grasses, dried ones, picked up by the female during the nest building. Thanks for visiting again. I’m still in disbelief this passion for bluebirding (for me) started March 2006. Here I am still loving it–even more than ever! All the best to you this year — happy nestbox monitoring and happy bluebirding! Feel free to share your nestbox stories with me. Just write to me here on this blog and request to have your story posted here. I’m happy to share it. Stay tuned for more updates and stories along the trail. See you soon! Same clutch of eggs. Note the bluer color in the eggs and less tan in the grass color. This is the true color of nest and eggs to the naked eye. Look how the flash in the camera makes these eggs look lighter in a turquoise-type color and the grasses tannish-brown. I have 3 eggs here in Stafford, Va. She laid her 1st egg on or around march 12th but may have been a few days earlier because I hadn’t checked the box before that. 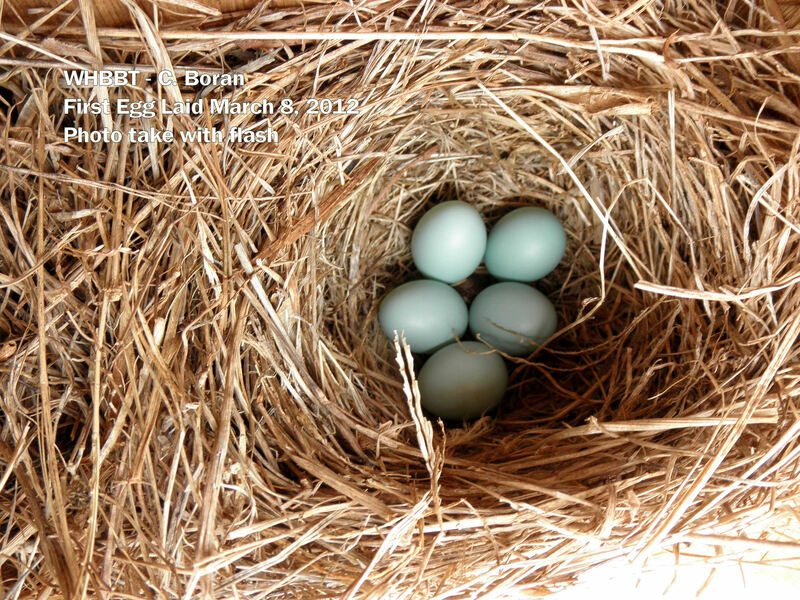 Her nest was finished on march 6th so not sure if she laid them before the 12th or not. can’t wait for this season of many bluebirds!! !